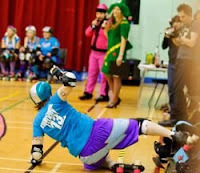 …Which is rather more interesting than your usual family arguments – yes, it’s the London Roller Girls at it again, the Steam Rollers taking on the Suffra Jets in a tense and fast bout. Not exactly easy to get good shots of the action – at f1.8 these still had to be shot at 1600ISO and above. And there’s not quite enough range on the nifty fifty to get all round the track. Oh well, just looks like I’ve got to fork out for a 105mm VR macro. But it’s a recession guv, I can’t afford that! A few rather spectacular spills and leaps, too, lovingly captured in glorious soft blur-o-rama. I need a D3, hint, hint! I’m just glad I was only taking the photos! 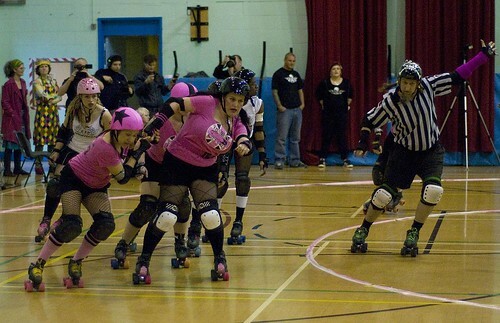 Still, the crowd did get a few of the Rollergirls in their laps…and they had to pay for the privilage, too. Ouch! (And guess who’s arm is in the picture again…*cough*. I shall be there again if I can. Saturday was a day of rain, long bus rides and aching feet. And to and from Tottenham to boot. But this was a surprisingly good thing, as I had a great time at the Riots of Spring – The delectable London Rollergirls taking on their firebreathing counterparts from the Glasgow Rollergirls in Roller Derby action. First Interleague bout, so I’m told. And there were more sights than to see too! Who could resist being sold cakes by a vendoress like the one on the right? (I certainly couldn’t, so sod the diet!). Beer (although no bitter, to my consternation), music, and a raffle all came as part of the show. And a post-game piss up which I was unfortunately unable to attend. All in all, a good evening’s entertainment. 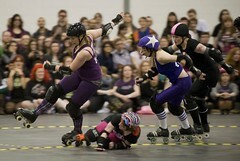 Final score: London Brawling 163, Irn Bruisers 31. Home win! 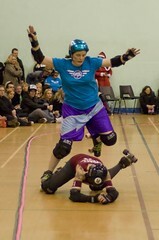 Next bout has a tentative date of June 7th, why not go along and support your local Dames on skates. Just remember to duck if you’re at the front. One more pic from me Here. And 4 more from Mark A Here too. Go take a look.